Beautiful patchwork quilt made of squares of top quality quilting cottons. Quilt measures approximately 97" X98" a generous queen size or king size quilt. The quilt is finished off with a cheery green binding that adds a pop of color to the beautiful backing fabric. The backing fabric is a tan with white flowers. The quilt is quilted in an all over meander. Quilts are made to used and loved! Quilts can be machine washed and tumbled or line dried. Thanks you for visiting QuiltsModern where patchwork quilts are made the modern way! 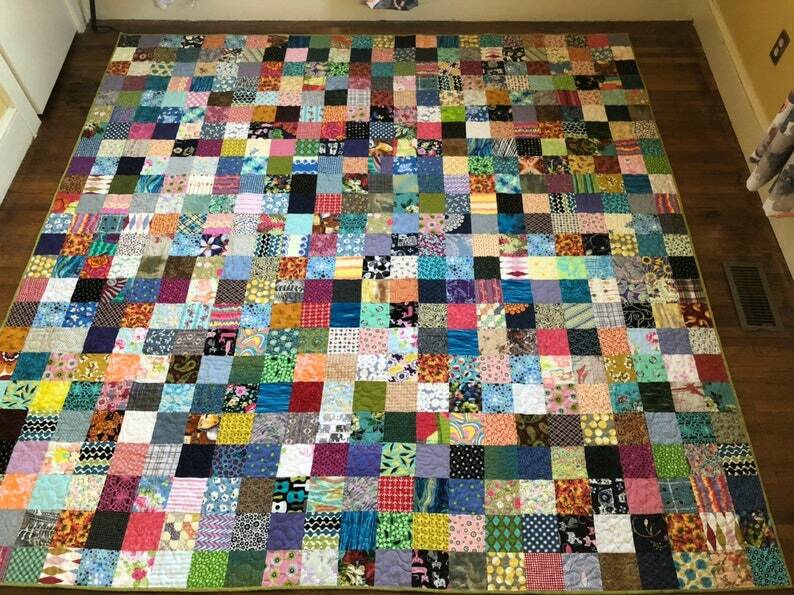 I make T Shirt quilts in my other Etsy shop (EggMoneyQuilts) and clients choose their fabrics from Fabric.com. I have pieces of fabric left and they find a new home in my patchwork quilts. I also have an extensive stash that I use too! !